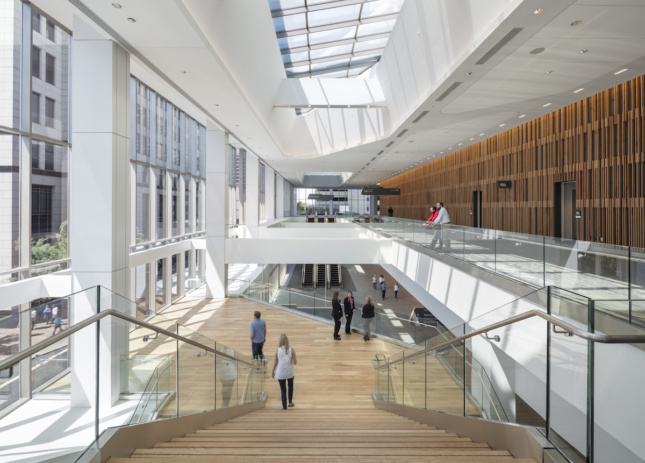 One of Louisville’s largest architectural eyesores recently received a shiny upgrade by Kentucky-based firm EOP Architects and HOK Chicago. The Kentucky International Convention Center (KICC), a 960,000-square-foot facility located downtown in the heart of the state’s largest city, reopened to the public this month after a two-year, $207 million renovation. 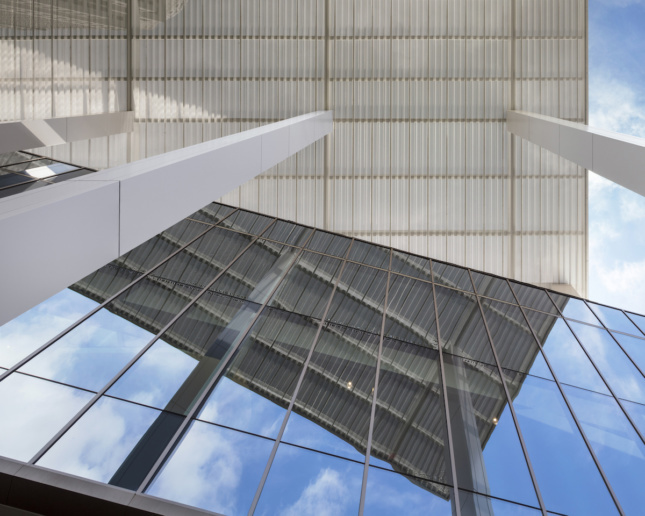 Thanks to a vision supported by the state, city, and the community, the glass-enclosed structure looks nothing like its dark, concrete-clad former self. The Brutalist building, long-despised by Louisville natives, now features a new transparent face along its western facade and includes improved public circulation spaces representing the structure’s new “extroverted personality,” according to HOK. The KICC has undergone several renovations since opening in 1977, but none of them were this dramatic. The architects collaborated with convention center specialist Donald Grinberg, FAIA, on the transformative design, updating its main entrance on Fourth Street and building a canopy with a colored lighting display to create a more welcoming experience for visitors. The glass panel exterior appears to undulate as the light shines on it throughout the day. Hovering over the sidewalk outside the property line, the upper-level floors provide sweeping views that are unattainable anywhere else in the building. 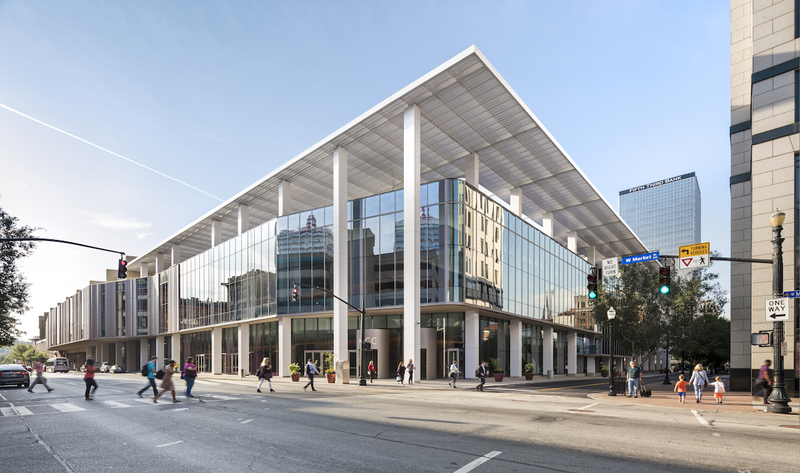 EOP Architects’ design partner and co-founder Rick Ekhoff explained that the flowing transparent curtain wall is a nod to Louisville’s history as a river city, and the new canopy symbolizes its extensive park system and the many local landscapes designed by Frederick Law Olmsted. Vertical oak wood paneling is a central design feature found throughout the bright interior and references the local bourbon distilleries that populate the Bluegrass State. The material starkly separates the “pre-function” gathering spaces—new areas for people to congregate before events—from the 40,000-square-foot ballroom and the 200,125 square feet of exhibit spaces. The redesign also included the addition of a 175-seat conference theater as well as new hybrid morning and evening restaurant called Oak & Brew. Peter Ruggiero, design principal at HOK’s Chicago practice, highlighted the much-improved wayfinding within the newly-renovated structure and the simplified circulation paths that open up the interiors to the outdoor spaces. The architects decided to place those spaces outside the larger, main venues and expose them to the light afforded by the new clear facade. They also integrated a central stair, configured in the spirit of a grand staircase, according to Ruggiero, that doubles as a meeting point with bleacher-like seating for alternative, informal events. Uniquely-shaped skylights create puddles of light and interesting shadows throughout the circulation spaces. At night, the building becomes a lantern in the city and illuminates the downtown streetscape. According to Ekhoff, the new design has already impacted development in the area. He sees the city’s tourism increasing now that the center looks like an inviting place to visit and invest in.